Where: US Park Police, District Two Parking Lot, Turkey Run Park, McLean, Va. Enjoy a scenic, 120 mile ride along the Potomac River with five stops to draw your cards. Ride ends at Growler’s Pub, in Olde Town Gaithersburg, Md at approximately 1PM. This event is to raise money for Officer Billy Brancato and his family to help with some of the bills that they have accrued due to Billy’s in-the-line-of duty injury. Officer Brancato was injured in January of 2012 while arresting a suspect who kicked Billy twice in the stomach resulting in permanent damage to Billy’s pancreas. Billy continues to undergo medical treatment and the end result is that his injury will complicate his life and health forever. Billy has been hospitalized numerous times since his injury and has had the usual difficulties with the Department of Labor in getting his medical bills paid. This year’s furloughs due to sequestration and during the government shutdown have not helped the Brancato’s financial situation. Billy’s wife, Megan (a public school teacher) and two children are struggling to keep up with their bills. 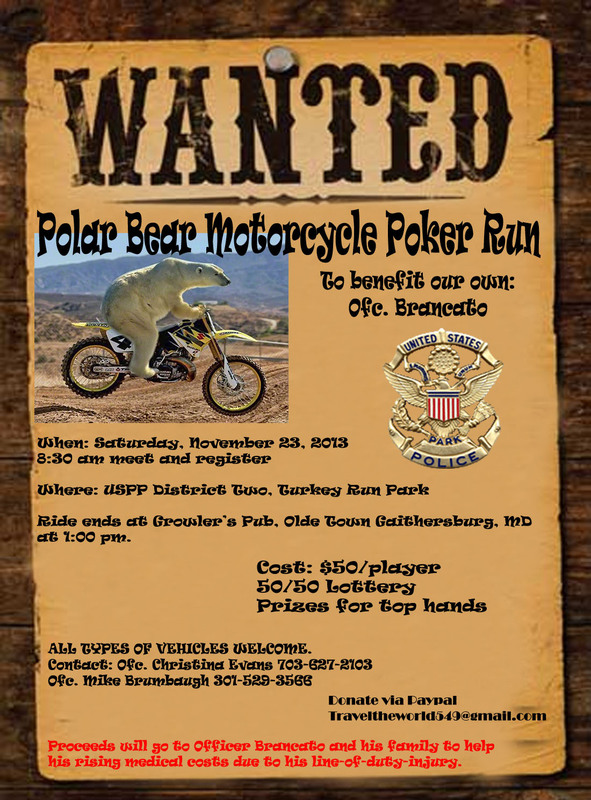 Let’s get together for a day of fun riding and raise some money for a very worthy cause. Cost: $50/Player (All proceeds going to The Brancato Family). At each stop you have the option to return your card to the deck and draw a different card for only $5. Prizes for the top hands at the ride’s conclusion. 50/50 lottery will also be held in conjunction with this event. Don’t have a motorcycle or don’t like riding in cooler weather? We still need some volunteers to help out with logistics or if you just want to support the cause come out and join us in your car. To donate via Paypal use Traveltheworld549@gmail.com.